The Borkum Riffgrund 1 offshore substation was installed in August 2013. Image courtesy of Dong Energy. Boa Barge 36 shipped the substation jacket and topside to the offshore site. Image courtesy of Bladt Industries A/S. The Borkum Riffgrund 1 wind farm features 78 turbines supported on monopile foundations. Image courtesy of Dong Energy. Bladt Industries constructed suction bucket type jacket foundations for the Borkum Riffgrund offshore wind farm. Image courtesy of Bladt Industries A/S. The 277MW Borkum Riffgrund 1 offshore wind farm in the North Sea, 55km from the north-western coast of Germany, is one of the world’s biggest offshore wind farms. The wind farm is operated and maintained by Denmark-based Dong Energy. The estimated investment on the offshore power project was €1.25bn (approximately $1.75bn). Dong Energy holds 50% ownership in the Borkum Riffgrund 1 wind farm, while KIRKBI and the Oticon Foundation, through its subsidiary William Demant Invest, hold 32% and 18% respectively. Offshore construction of the wind farm began in 2013 and commercial operations started in October 2015. The wind farm is expected to power approximately 320,000German households. "The wind farm is expected to power approximately 320,000 German households." The wind farm occupies an area of 36km² and comprises 78 Siemens 3.6MW three-bladed cantilevered wind turbines with rotor diameters of 120m. The turbines have 58.5m-long blades and a swept area of 11,300m². The wind farm features an offshore substation comprising two main transformers. The substation platform comprises a topside fixed on an eight legged steel jacket supported by piles. Suction Bucket Jacket foundations, fabricated by Bladt Industries, were used to hold the offshore wind turbines in place. The 34kV power generated by the wind turbines is increased to 155kV by the offshore substation before transmitting it to the DolWin alpha, a high-voltage direct current converter station, via two high-voltage cables. The 155kV AC power is converted into 320kV DC electricity and transported to the Dörpen West Converter station, the onshore grid, using two high-voltage direct current (HVDC) cables. The DC power is again converted into AC power before supplying to the German 400kV main grid. The offshore substation weighs approximately 3,500t, and was installed in August 2013. The topside and substation jacket were shipped by Boa Barge 36 vessel. The substation structure is supported by eight monopiles. A three-fold bubble curtain minimised noise during construction. "The first four foundations and transition pieces were transported to the site using Pacific Orca vessel from the load out port in Aalborg, Denmark." The first monopile foundation for the turbines was laid in January 2014. The initial four foundations and transition pieces were transported to the site using Pacific Orca vessel from the load out port in Aalborg, Denmark. Each monopile weighs up to 750t and has a diameter of 6m. The other major offshore construction works include the laying of submarine export cables, and the installation of turbines. A harbour facility Norddeich, Germany, was used for the construction supervision and further operations and maintenance. Siemens was the supplier of the turbines for the Borkum Riffgrund 1 wind farm. The contractual scope for Siemens includes the installation and commissioning of the wind turbines along with providing maintenance services for five years. A2Sea supplied its offshore installation vessel SEA INSTALLER to install the wind turbines in the sea. Combi lift was awarded the contract to transport the transition pieces and monopiles for the turbines. Nexans was awarded the contract to supply medium-voltage submarine cables for the wind farm. GeoSea was awarded the contract to install the monopile foundations with scour protection for the wind turbines. GeoSea transported the foundation structures to the Orange Blue Terminal in Eemshaven, Netherlands, and stored them temporarily at the terminal. The contract for the detailed design of the topside and jacket for the offshore substation was awarded to ISC. 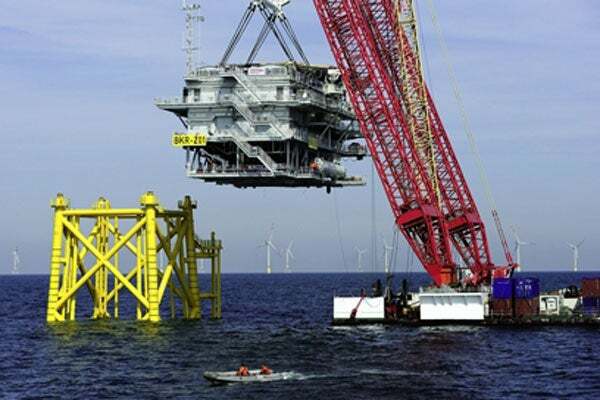 Bladt Industries constructed the offshore substation and the jacket. The jacket foundation and substation topside installation contract was awarded to Scaldis Salvage Marine Contractors (Scaldis SMC), who subcontracted Volker Staal en Funderingen for the jacket installation. ITW Polymers provided the substation grouting while Mercell installed the substation control system. Norddeutsche Seekabelwerke was awarded a contract, in November 2011, to supply and install 26km of 155kV AC power submarine cable system for connecting the offshore substation to the DolWin alpha converter station. Semco Maritime was awarded the contract for the design and installation of electrical and utility systems for the offshore substation. Blue Offshore assisted in the installation of the 155kV AC submarine cable systems. CT offshore was awarded the contract for the cable installation and inter-array cable burial. TenneT Offshore, a subsidiary of TenneT TSO, was engaged to provide grid connection from the offshore substation to the onshore grid.